The night light can be switched between the Warm White and Colour Change modes. The light can also be turned on / off permanently. The colour can be paused by pressing the colour mode button allowing you to select a colour of your choice. Colours include: Red, Green, Blue, Purple, Pink, and Orange. The Auraglow Plug-In Night Light with daylight sensor is ideal for adding a gentle light to nurseries, children’s bedrooms, landings and hallways. 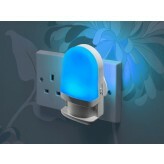 The night light consists of 4 Auraglow LED’s which activate in darkness and turn off automatically when light is detected. The extremely energy efficient LED's consume just 0.7w in energy and the night light stays cool to the touch. Suitable for use with any UK square pin 13A domestic mains socket - Fully CE & BS Standard approved. Dimensions: 120 x 30mm (H x W), Power Consumption: 0.7w, Bulb Life: 20,000hrs.